Eugene Schilling was born in Seattle, Washington but grew up in a small town in Nebraska. He currently serves as Professor of Art and Gallery Director at Adams State University in Alamosa Colorado. 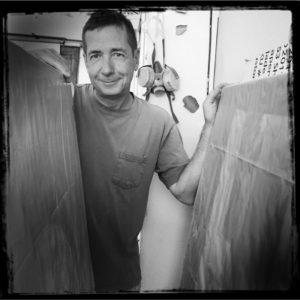 Schilling earned his BFA Degree at the University of Nebraska and his MFA at Colorado State University. Schilling’s paintings and drawings have been exhibited nationally (Los Angeles, CA, San Francisco, CA, New York, NY, Denver, CO, Philadelphia, PA, and Taos, NM) and internationally (Wales, Brazil, China, and Japan). His work is also represented in private, corporate and permanent collections including Kaiser Permanente, Trans World Bank, Chevron Corporation, Chongqing University, Isetan Museum of Fine Art, and the Berman Museum of Art. Schilling was awarded Honorary Professor of Painting at Chongqing University, Chongqing, China. He has also received the Francis Vreeland Award in Art at the University of Nebraska, the Colorado State University Fellowship in Art and the Presidential Teacher Award, Adams State University.